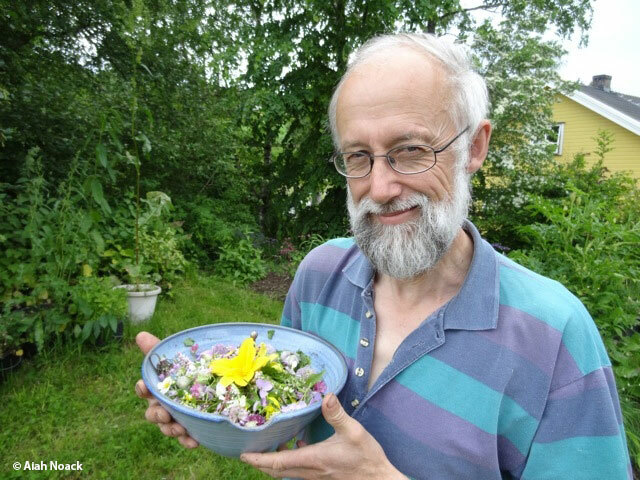 In the town of Malvik on the north coast of Norway near the Arctic Circle lives an extraordinary gardener, Stephen Barstow, inventor of the ‘extreme’ salad. Originally from Britain, my wife, Eileen Stoupe, and I moved to Norway in 1981. Both vegetarians (virtually unheard of in Norway at that time) and keen organic gardeners, we were keen to experiment with growing food at extreme latitudes where carrots and potatoes was usually the choice of available vegetables. This spirit of adventure has culminated in the establishment of an abundant edible garden and the world record for the greatest number of plant varieties in a salad. The world record attempt all started on 19th August 2001 when I decided I wanted to break the record for the greatest number of plant varieties in a salad with plants grown in our garden. From internet searches beforehand, however, it didn’t seem that anyone had been daft enough to try this at 64ºN. The salad itself was composed and put together in connection with the Norwegian National Open Organic Garden Day. The final salad had a grand total of 363 distinct plant varieties and 382 distinct plant parts (i.e. including flowers and leaves from the same variety). All bar two of the varieties were collected in the garden. This was well and truly beaten at the follow-up event on 24th August 2003, however, when I put together a salad with 537 varieties. It took 20 hours and help from neighbour and professional chef, Trond Nubdal, to assemble and document the salad’s ingredients. In addition, many hours were used in planning what plants should be used from which beds in the garden. The vast majority of the plants (all but 28) were organically produced in the garden, not bad given that we have just two seasons a year – one green and one white winter! Of the plants used, 70 were different types of onion (Allium spp.) and 60 different edible flowers were used to decorate the salad. Horseradish, mustard greens and Day Lily flowers (Hemerocallis) gave a peppery taste; several halophytes (plants which grow in high salt environments) contributed a salty sensation; seeds, nuts and Alpine Bistort bulbils (Polygonum viviparum) a common wild plant in Norway which gave a nutty taste; Sweet Aztec Herb (Lippia dulcis) added a sweet taste; Lemon Verbena and Lemon Mint, a fresh lemon taste. Visitors were able to sample the salad during the day and many were impressed by the multiple-taste experience (how many different flavours can the brain process simultaneously?). I have no plans, however, to try and outdo the record in the near future. The making of extreme salads was a gradual development. On Saturday evening the family would have pizza for dinner (popular with the kids) and I would always make a salad to go with it. As the collection of edibles in the garden increased so did the number of species used in the salad. But due to the time needed to prepare the ingredients, I wouldn’t normally use more than 30 varieties. The record salads were also partly inspired by ritualistic spring dishes traditionally prepared in Mediterranean countries, such as the Italian dish ‘Pistic’, in which more than 50 wild greens are used. As traditional gatherers, we are no doubt adapted to eating a wider range of greens than we do and like the late forest garden pioneer, Robert Hart, I believe there are real health benefits from increasing the diversity of plants in the diet. Another notable salad I prepared in June 2002 was put together in connection with the official opening of the new Renaissance Garden at the Ringve Botanical Garden in Trondheim. This is a historical herb garden demonstrating vegetables, medicinal and seasoning herbs and flowers which were grown in Trondheim in the 17th century. The garden was opened on the 300th anniversary of the publishing of Norway’s first gardening book Horticultura, written by Christian Gartner, the town’s official gardener at the time. The salad contained about 80 of the varieties grown in the garden, truly a Renaissance salad. One interesting fact is that Jerusalem Artichokes from North America were already grown in Trondheim at the time of Gartner’s book, predating the South American potato. Future salads are likely to be theme salads like the Renaissance salad. In my opinion, a good mixed salad should include a mix of taste sensations. Some of the varieties actually come into their own only when mixed with other things or coated with salad dressing – a salad with just mallow leaves wouldn’t be very exciting, for example, and a lot of people are put off mallow leaves when they taste the leaves alone. Bitter tasting greens such as dandelion are also much improved in a mixed salad. A choice of cultivars with coloured or variegated leaves adds to the visual impact as do many different sorts of flowers. The springtime is in many ways the best time of year for salads. At this time, the new growth on perennial greens (including a number of wild plants and weeds) is at its best. Fast growing salad crops which grow best in low temperatures become available and some overwintered tubers such as Jerusalem Artichokes can be dug up before the plants start to grow. Ground Elder (Aegopodium podograria), and the variegated cultivar which we have introduced, are one of the best and we use this almost every day in spring; Giant Bellflower (Campanula latifolia) collected in the Middle Ages in spring by local farmers; Sorrel (Rumex acetosa) most Norwegian kids of my generation would have eaten this plant while playing; Dandelion (Taraxacum officinale), both leaves and flowers; Lady’s Mantle (Alchemilla spp. ); Viola spp. (one of the earliest spring edible flowers); Hedge mustard (Alliaria petiolata), both leaves and flowers. Quite a few edibles have gone wild in the garden and when they are useful this is encouraged. Good examples are the biannual Chervil (Anthriscus cerefolium); annual Garden Orache or Mountain Spinach (Atriplex hortensis), a mixture of red, green and gold-leaved cultivars are available; Ragged Jack Kale (let kale seed in its second year and you can have masses of delicious young plants the following spring); others are Lamb’s Lettuce (Valerianella locusta) and Miner’s Lettuce (Claytonia perfoliata), both often grown as winter crops in milder climates than ours. Grown in a cold greenhouse for early harvesting, seed sown as soon as the soil is frost-free include favourite oriental greens such as Mibuna, Mizuna and Tatsoi, Mustard Greens (particularly frilly varieties and Giant Red), Kale (harvested young), Arugula or Rocket (Eruca sativa), Turnip Greens, various varieties of Cress (Lepidium sativum) and Radish. Good spring perennial salad plants include various Dandelions (Taraxacum species and vegetable cultivars), Buckler-leave sorrel (Rumex scutatus) try the silvervariegated form ‘Silver Shield’, perennial Mallows (Malva moschata, M. sylvestris and cultivars), Tulip (flower petals only), Mitsuba or Japanese Parsley (Cryptotaenia japonica), in particular the redleaved cultivar, ‘Atropurpurea’, the Anise Hyssops (Agastache spp. ), favourites being Agastache foeniculum, the true Anise Hyssop, (A. rugosa), Korean Mint and the yellow leaved cultivars of both of these and Hop shoots (Humulus lupulus). There are also many Onions (Allium spp.) to choose from as soon as the ground is frost-free: some of our spring favourites are Mouse Garlic (Allium angulosum), Egyptian Onion (A. cepa proliferum) and cultivars, Nodding Onion (A. cernuum), Siberian Garlic Chives (A. nutans), Twistedleaf Garlic (A. obliquum), Chives (A. schoenoprasum), German Garlic (A. senescens montanum), Prairie Onion (A. stellatum), Korean Ornamental Onion (A. splendens). Allium zebdanense is particularly useful as it flowers early and the beautiful white flowers can be used. Sweet Aztec Herb (Lippia dulcis) and Stevia are examples of plants kept inside at room temperature over the winter. Both have very sweet-tasting leaves. Overwintered Tubers (harvested in spring). Both Jerusalem Artichoke (Helianthus tuberosus) and Chinese Artichoke (Chorogi) are hardy enough to leave in the ground for spring harvesting. Chorogi is an example of a so-called jokeplant (as the tubers resemble giant larvae, but are otherwise fairly tasteless). Stephen Barstow will be holding two talks in the UK in May. Stephen has various other talks across Europe, visit www.edimentals.com/blog/?p=1058 for more.